2/9/10 - BCS updated with over 100 new levels and Triptych goes on sale! 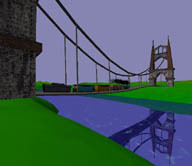 Bridge Construction Set had been updated with over 100 new levels and Triptych goes on sale! Triptych is now on sale for only $6.95. If you have been waiting to get your hands on the full version of Triptych now is your chance! Get it while its hot. Triptych and Bridge Construction Set are available for Windows, OSX and Linux.